As the chief executive of Girl Effect, former Abbott Mead Vickers stalwart Farah Ramzan Golant is undertaking the biggest transformation of her career. The world’s biggest untapped resource is not a fledgling form of renewable energy or an emerging technology platform but young girls. According to Girl Effect, the social enterprise designed to transform the way that girls view themselves, they are the most marginalised people within their communities in parts of the developing world. When a girl turns 12 years old and lives in poverty, her future is often out of her control – she may find herself married at 14 and pregnant by 15. Expectations for their life experiences are low: 84% of Ethiopian girls, for example, do not attend secondary school. 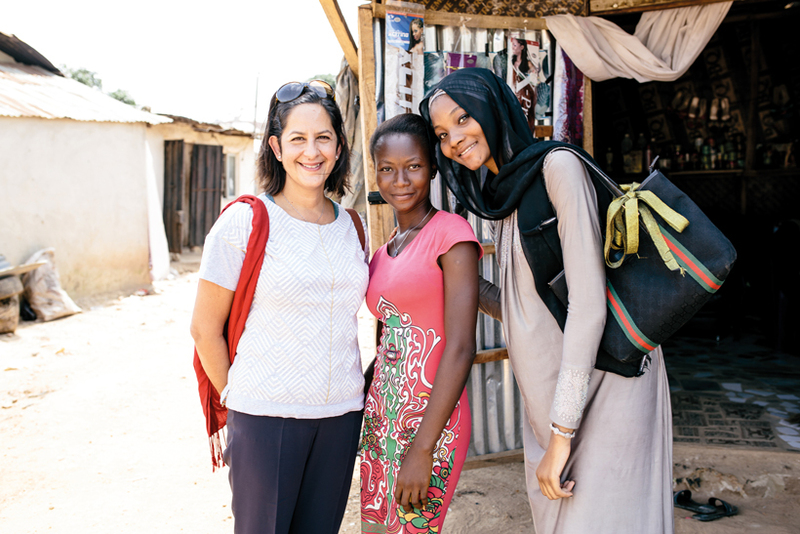 As chief executive of Girl Effect, Farah Ramzan Golant (pictured, above, in a classroom in Ethiopia) is expanding girls’ horizons. Sitting in the brand’s central London office, she is evidently comfortable in her own skin and assured of the role of the company and the brands it has created in delivering meaningful change in the world. "I had an abstract sense of it but I underestimated the degree to which girls are a point of leverage to disrupt poverty. I underestimated the power of girls connecting with each other and how quickly you can create new behaviours," she explains. Girl Effect was launched more than a decade ago by the Nike Foundation, which began investing in placing girls at the centre of the development agenda. Since then, it has worked with more than 150 partners in 80-plus countries. The charity became an independent entity in 2015 (when Ramzan Golant became chief executive) and has its sights set on 30 million active participants by 2020 and inspiring more than 350 million people to create a "new normal" for girls. In simple terms, Girl Effect exists to use the tools of marketing as agents of social change. To achieve this, the company has created three "culture brands": Yegna in Ethiopia, Ni Nyampinga in Rwanda and Zathu in Malawi. They span radio shows and dramas, TV, digital and music. This endeavour is no mean feat. When Girl Effect launched an outdoor campaign for Ni Nyampinga, it had to start by building the infrastructure itself – not your typical marketing problem. However, the most important network the brands have grown is one of local advocates; young girls acting as a conduit for change within their own communities. Yet using traditional media channels such as magazines has been transformative. Ni Nyampinga (which roughly translates as "A girl who is beautiful inside and out, who makes wise decisions") uses a network of girls to distribute a magazine that features content on women who are forging new pathways and careers. Ramzan Golant explains: "It is shocking how you can create change with such tools and how quickly you can show that change in behaviour. I could see that quickly and how Gen Z are yearning for agency, voice and a sense of value." There is no question that becoming chief executive of a social enterprise marks a significant step change for Ramzan Golant. Having made her name at Abbott Mead Vickers BBDO, she joined TV production group All3Media as chief executive before leaving in 2014 after completing its £550m sale to a new joint venture between Liberty Global and Discovery Communications. It was from here she made a leap of faith to lead Girl Effect: "I knew nothing about development but I know a great deal about creating brands for social change." She had no hesitation in taking up the challenge – a move that has seen her travel about as far from the London advertising bubble as you can imagine. "I had one day in Ethiopia that really sticks in my mind as it was a real day of extremes," she explains. "I started the day with a girl-led learning journey – I followed her throughout the day, doing her chores. I knew I would be dealing with a visceral subject matter. She was raped at 13, had a one-year-old child, her father had died and her oldest brother was caring for all the siblings." Yet what Ramzan Golant discovered was fundamentally uplifting: "I was prepared for the hard yards, but what I was not prepared for was her resilience. She had a vision for herself – she was going to get on track so her daughter had a different trajectory. The sheer wellspring of ingenuity meant I learned what hope really looks like." Now the organisation is focused on utilising mobile technology to mobilise and realise this hope at scale. The possibilities of billions of people connected by mobile devices, with unprecedented processing power, storage capacity and access to knowledge, are unlimited. "The world of development is in the midst of rapid transformation – mobile technology is transformative," Ramzan Golant explains. "Girls living in the slums of Delhi have WhatsApp; we can shift attitudes and behaviours, challenge social norms and constantly track and monitor how that change is happening." Girl Effect already has 30 million people on a data platform to constantly monitor the effectiveness of its messaging. This marriage of creativity and honest data is core to the company’s credibility and proposition. Yet this focus on changing behaviour has not always been easy. The charity has faced up to fierce criticism from some sections of the press, such as the Daily Mail trumpeting the fact that Yegna, known as "Ethiopia’s Spice Girls", recently had funding stopped by the British government. A criticism that is perhaps a reflection of a market happy to invest in bricks and mortar but not so much in marketing to help realise human potential. It was an experience that didn’t shake Ramzan Golant’s focus: "With hostile media, you know who your champions are – don’t get angry, don’t lose sleep or sight of your moral compass. It is painful but you have to keep your lens on what matters." It is clear that Ramzan Golant maintains this focus by keeping her feet planted in the here and now: "At AMV, I always had the feeling that I was in the wrong room." With disarming honesty, she articulates the inability to split yourself in two that comes with the ever-elusive and often thankless pursuit of balance: "I was at work when I felt I should have been at a parents’ evening and I sometimes had a sense of being in the wrong place." But now she says she views her life and work in cycles: "I don’t do guilt, I create energy and focus. I take holidays religiously and I don’t try to be somewhere else anymore." If Girl Effect can realise its goal to reach 100 million people by 2020, the possibilities for millions of girls will transform. The role of brands in social change – not just to disrupt an industry but change how people see themselves – is one of the industry’s most powerful untapped resources.